BREATH THERMO MAINTAINS THE BODY TEMPERATURE STEADY UNDER VARIOUS CONDITIONS. Breath Thermo is a remarkable heat-generating fabric that absorbs body moisture and then uses it to generate heat. The air that is heated by the absorption process is trapped between the fibers, so the space between garment and body remains warm and dry. 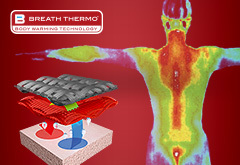 WarmBreath Thermo fibres capture body vapor molecules, which constantly evaporate from the body. Once captured, the micro oscillation of the vapor molecules turns into thermal energy generating heat. Breath Thermo fibres can capture more vapor molecules than wool or polyester, which is why Breath Thermo can keep you warmer. DryHigh absorbency keeps excess moisture away from the body, and comfortable. Breath Thermo quickly dries off absorbed moisture, which prevents feeling cold after sweating. DeodorantBreath Thermo helps deodorizing by absorbing and prevents causing the three main factors; Ammonia, acetic acid, and isovaleric acid, of body odor.＊The function is especially for under wear items. Steam coming out from wet sheep is a well known scene from the old days. It's a known fact, that the fur and feathers from marsupials and birds generate heat when becoming wet, and they prevent the loss of body temperature. There was nobody who could implement this mechanism with man-made fibre. But an engineer from MIZUNO did while he was searching for heat-retaining material. Developed for daily use with light weight design. Combined with polypropylene reduces 20% weight. Thinly made, good for all seasons. Medium thickness material for autumn, winter, and early spring. 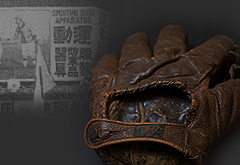 Also for winter sports. For extreme cold land. The material is "braid over braid" and "raised back hair" combined. Combined with wool, it gives a warmer and dry comfort. ＊The product varies depending on the region.